Art Teacher Lauren Macke’s creative talents go well beyond her classroom at DePaul Cristo Rey. This holiday season she was tapped to deck the halls at the historic Cincinnati Art Museum. 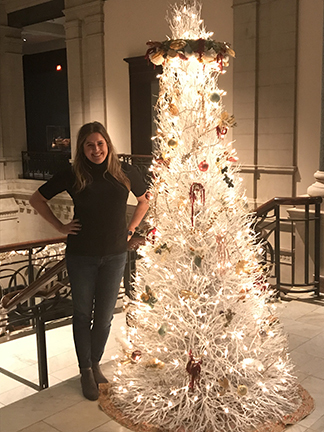 Lauren teamed with two other artists to design, build and install holiday décor to give this iconic Cincinnati institution a new holiday look. They took inspiration from the museum’s current exhibition, “The Fabric of India,” and spent days before, during and immediately after Thanksgiving weekend transforming the museum’s Great Hall, and the areas and hallways around it, with decorations that enhance the beauty of the architecture and art. The museum is open Tuesdays through Sundays at 953 Eden Park Drive in Cincinnati. Admission is free. The holiday display will be available through January 6.